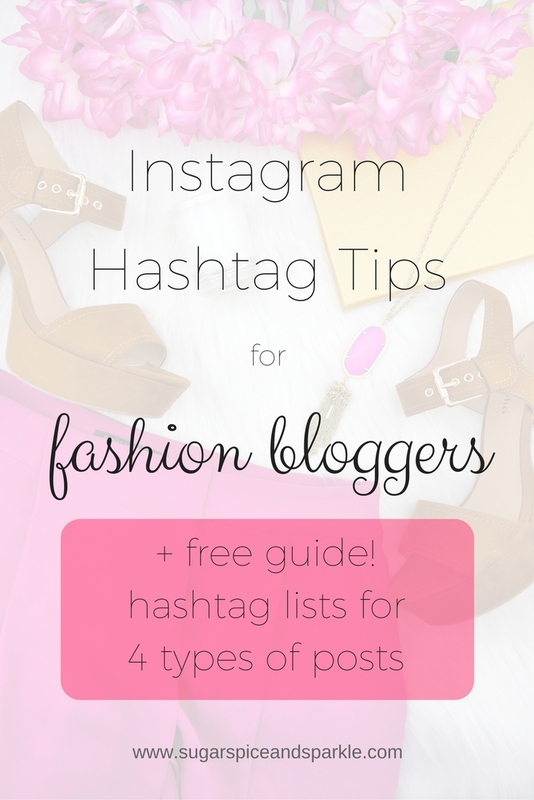 Instagram Hashtags for Fashion Bloggers + Freebie! Oh Instagram... sometimes I think back to the simpler days of posting whatever was going on in my life with whatever dull lighting was available and getting excited when my likes turned from names to a number. Who can relate? Well times have changed and we can no longer rely on friends' likes alone! As Instagram continues to grow as a marketing tool with their ever changing algorithm we as influencers and bloggers have to keep up. Hashtags are a major key to growth and engagement. Keep reading to get the exact hashtags I use. Sign up below for instant access to the guide! Hashtags allow you to be discovered on Instagram by people other than your followers (and these days even by your followers thanks to that darn algorithm!). Posts with at least one hashtag perform 12.6% better than those without (via Hootsuite). Increase engagement on your post by liking and commenting on other posts with the hashtag before and after posting. Keep the likes and comments coming. Hashtags make it so people can find your post loooong after you've posted it. I still get likes and comments on weeks old posts thanks to #s.
You can use up to 30 hashtags on an Instagram post. I typically include 2-3 in the caption then post the rest as the first comment. Add hashtags right after you post - your post will be added to the hashtag based on the time of the post, not the time of the hashtag being added so add them right away so you can be on top! Google it! There are some great posts that list popular hashtags for certain niches. Google never fails, amiright? Check out the "big names" in your niche. Who are your role models on IG? Go check them out and see what hashtags they are using. If you want their followers to be yours, start using the same hashtags. Search hashtags on Instagram. When you search and select a hashtag there will be a line along the top of 'related hashtags'. Add these to your list as they are likely in the same niche. Pay attention to usage. You don't want to use only hashtags that have millions of posts on them and you don't want super unique ones with only 28 posts on it either. Find that sweet spot - I like hashtags that have 50k - 500k posts. A good mix of those will allow you to be found because they're not too scarce but you also won't get buried literally the second you post becuase err body is using that #. Got more questions? Just email me! I'm here to help! I have been trying to include more hashtags in my post so this will be super helpful! Thanks for posting. Love all this. Thank you for all your amazing tips! !